The simple geometric appeal of the stainless steel gold finish metal frame offers a dramatic look to this accent chair. Button tufting on the seat back and seat add mid-century flair. 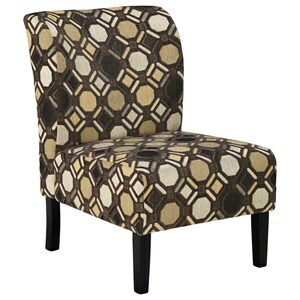 Low-pile velvet fabric will make this chair a sophisticated accent in your living space. The Trucker Gold Finish Metal Arm Accent Chair with Velvet Fabric by Signature Design by Ashley at Casa Leaders Inc. in the Wilmington, Long Beach, Torrance, Lakewood, Los Angeles area. Product availability may vary. Contact us for the most current availability on this product.